The HRD Ministry has received representations from several minority organizations seeking clarification on the applicability of the provisions of the Right of Children to Free and Compulsory Education (RTE) Act, 2009 on minority institutions in light of the provisions of Article 29 and 30 of the Constitution. The matter has been examined in the HRD Ministry. Wide ranging consultations have also been held to obtain views and opinion of various stakeholders on the subject, and the following guidelines are accordingly issued under sector 35(1) of the RTE Act, 2009. Institutions including Madrasa and Vedic Pathshalas especially serving religious and linguistic minorities are protected under Article 29 and 30 of the Constitution. The RTE Act does not come in the way of continuance of such institutions or the rights of children in such institutions. Schools are defined in section 2(n) of the RTE Act. Sections or minority organizations covered within the meaning of section 2(n) of the Act, will be governed by the provisions of the RTE Act, 2009. Appropriate Governments and local authorities shall ensure that the rights of Minority Institutions, guaranteed under Article 29 and 30 of the Constitution, are protected while implementing the provisions of the RTE Act. The HRD Ministry has received representations from several unaided and aided schools seeking clarification on the procedure to be followed for admission. The Ministry held a meeting with various stakeholders on the 14th August, 2010 to elicit their views for formulating a guideline for admission, which would be consistent with the spirit of the RTE Act, specifically with section 13(1) read with section 2(o) of the Act. Section 13(1) of the Right of Children to Free and Compulsory Education (RTE) Act 2009 provides, that while admitting a child, no school or person shall subject the child or his/her parents to any ‘screening procedure’. Section 2(o) of the RTE Act defines the term ‘screening procedure’ to mean the ‘method of selection for admission of a child, in preference over another, other than a random method’. Further, section 12(1)(c) of the Act provides that unaided schools and specified category schools shall admit at least 25 per cent of the strength of class1, children belonging to weaker section and children belonging to disadvantaged group from the neighbourhood and provide them free and compulsory education till completion of elementary education. Further, where the school admits children at pre-primary level, such admissions shall be made at that level. The objective of the provisions of section 13(1) read with section 2(a) is to ensure that schools adopt an admission procedure which is non-discriminatory, rational and transparent and that schools do not subject children and their parents to admission tests and interview in order to decide whether they will admit a child or not. Admission tests and interviews are generally a tool for profiling and eliminating children, and therefore, screening to assess a child’s intelligence’ should be prohibited. The RTE Act is approved in the belief that availability of equal educational opportunities to children belonging to different social and economic background will reinforce the idea of equality ensures to our Constitution and ensure that children are not discriminated on the basis to social or economic background or any such criteria. There is need for moving towards composite classrooms with children from diverse backgrounds rather than homogenous and exclusivist schools. It is an academically established point that heterogeneity in the classroom leads to greater creativity. Keeping these objectives in view, the following guidelines are issued under section 25(1) of the RTE Act, 2009. (i)	With regard to admissions in class 1 (or pre-primary class as the case may be) under section 12(1)(c) of the RTE Act in unaided and ‘specified category’ schools, schools shall follow a system of random selection out of the applications received from children belonging to disadvantaged groups and weaker sections for filling the pre-determined number of seats in that class, which should not be not less than 25 per cent of the strength of the class. (ii)	For admission to remaining 75 per cent of the seats (or a lesser percentage depending upon the number of seats fixed by the school for admission under section 12(1)(c), in respect of unaided schools and specified category schools, and for all the seats in the aided schools, each school should formulate a policy under which admissions are to take place. This policy should include criteria for categorization of applicants in terms of the objectives of the school on a rational reasonable and just basis. There shall be no profiling of the child based on parental educational qualifications. The policy should be placed by the school in the public domain, given wide publicity and explicitly seated in the school prospectus. There shall be no testing and interviews for any child/parent falling within or outside the categories, and selection would be on a random basis. Admission should be made strictly on the basis. As it stands, the Right to Education Act has several flaws that will prevent its efficacious implementation. Several amendments are called for. Something that cannot work, will not work. This is a tautology applicable to the Right to Education (RTE) Act, which cannot meet the objectives for which it was enacted. There are several reasons for this. First, the Act does not rule out educational institutions set up for profit (Section 2.n.(iv)). The protagonists of such institutions cite Article 19.1.g (“All citizens shall have the right to practise any profession or to carry out any occupation, trade or business”). However, they fail to realise that the Article is regulated by Article 19.6: it is because of the provisions in Article 19.6 that no one in the country can set up a nuclear energy plant, or grow narcotic plants, or build satellites, unless approved by the government. P.N. Bakshi, a member of the Law Commission, in his book on the Constitution of India says: “Education per se has so far not been regarded as a trade or business where profit is a motive.” Yet, the TMA Pai Foundation vs Government of Karnataka judgment of the Supreme Court in 2003 said it is difficult to comprehend that education per se will not fall under any of the four expressions in Article 19.1.g. Therefore, appropriately, the model Rules and Regulations (R&R) for the RTE Act say in Section 11.1.b that a school run for profit by any individual, group or association of individuals or any other persons, shall not receive recognition from the government. However, this Section will not be binding on the States as it is not a part of the Act. If the Government of India were serious about the issue, it should have made this a part of the RTE Act. The common-sense resolution of the discrepancy between the TMA Pai Foundation judgment and the model R&R for the RTE Act could lie in the fact that education is a generic term. We need to distinguish between the minimum quantum of education that a citizen should have in order to be able to discharge his or her responsibilities and claim rights, and the subsequent education geared to train him or her for a profession such as medicine or engineering. As regards the first category, it is now virtually universally recognised that 12 years of school education beginning at the age of six, preceded by appropriate pre-school education, is a minimum requirement. Therefore, in virtually all developed countries, a vast majority of children including those of the rich and powerful go to government schools for 12 years of totally free education. The RTE Act is unconcerned about the four most important years of school education – that is, from Class IX to Class XII. The second category would include three sub-categories: (a) higher education that could lead to a technical diploma, a first university degree in broad areas such as the liberal arts, science or commerce, or post-graduate education in these areas; (b) education leading to a university degree, in a common profession of prime public interest that would cater to the basic needs of society, such as medicine, engineering, law, or management; and (c) education leading to training in specialised areas (which could vary with time), such as flying, catering or hotel management, which does not lead to a degree but is a prerequisite to join the profession at an appropriate level. It stands to common sense that the first category should be totally free with no hidden costs whatsoever. In the second category, in the public interest and to ensure that quality is maintained, education in sub-categories (a) and (b) must be in a non-profit organisation. The selections should be made on merit in a means-independent way which would imply that appropriate fees could be charged from those who can pay. Those who cannot pay must be able to continue their education through freeships or scholarships, or bank loans arranged by the institution. There is no argument against education in sub-category (c) of the second category being provided for profit, for the employers will ensure quality in the institutions providing such education. The judgment in TMA Pai Foundation would appropriately apply to sub-category (c). There is, therefore, a strong case to ensure that Section 11.1.b of the model R&R of the RTE Act is made mandatory for all schools without exception, through an amendment of the Act. There is the argument that if people can pay for the education of their children they should have a right to have their own schools where the fee charged would be determined by them or the authorities of the school they set up. Indeed, according to the Constitution we cannot ban such schools, which will essentially be the de facto profit-making schools of today where almost exclusively the children of the rich and powerful go. However, the government will be within its rights to say that such schools would not be recognised as they would violate the principle of equity in regard to the minimum education that every Indian citizen should have. •Experience tells us that no government school is likely to function well (or as well as the government schools did till about 1970) unless children of the rich and powerful also attend such schools. Further, it is a myth that private – de facto commercial – schools provide better training than, say a Central School of the Government of India or trust-run schools which are truly not-for-profit. •The Act places no restriction on the fees that may be charged by unaided private schools ostensibly set up as a Society or Trust but, de facto set up to make money for the investors, just like a corporate company. If they are truly set up not to make any profit they should not be charging any fees, and the fees paid by the children should be reimbursed by the government. They could then function as a part of the common school system in which children of the neighbourhood would have to go irrespective of their class or status. •Why should unaided private schools have a system of management with no obligatory participation of parents, unlike other schools that require the formation of a school management committee in which parents will constitute three-fourth of its membership? •Why do we have only 25 per cent poor children in private unaided schools? Why not 10, 20, 40, 60 or 80 per cent? Would it not create a divide amongst the children of the poor, leave aside a greater divide between the children of the rich and the poor? •No method is prescribed for selecting the 25 per cent poor students for admission into unaided private schools. Selection by lottery would be ridiculous. In the absence of a viable provision, the private unaided (de facto commercial) schools can choose the 25 per cent poor children in a way that the choice would benefit the school. •There is nothing in the Act or its R&R that will prevent unaided private schools from charging students for activities that are not mentioned in the Act or its R&R. Examples would be laboratory fee, computer fee, building fee, sports fee, fee for stationery, fee for school uniform, fee for extra-curricular activities such as music, painting, pottery, and so on. •Norms for buildings, the number of working days, teacher workload, equipment, library and extra-curricular activities are prescribed only for unaided schools, and not for other schools including government schools. Only an obligatory teacher-student ratio is prescribed both for government and unaided schools. This means that as long as the teacher-pupil ratio is maintained, the school would be considered as fit. Thus, even if a government school has 12 students in each class from I to V, it will have only two teachers. •Two arguments often given for continuing to have, or even encouraging, private unaided schools is that the government has no money to set up the needed schools, and that government schools cannot be run as well as private schools. Both these are deliberate lies. There have been excellent studies and reports that show that the government can find money to adopt a common school system with a provision of compulsory and totally free education up to Class XII in the country over the next 10 years. Further, even today the best system of school education in the country is the Central School (Kendriya Vidyalaya) system run by the government. The country needs 400,000 such schools, and India can afford it. The RTE Act and its R&R are destined not to work. We should recognise that if we do not take appropriate care of school education, agriculture and left-wing extremism – and all the three are related – we may be creating conditions that would encourage internal turmoil. One hardly needs a reminder that the Right to Education is different from the others enshrined in the Constitution, in that the beneficiary cannot demand it nor fight a legal battle when the right is denied or violated. 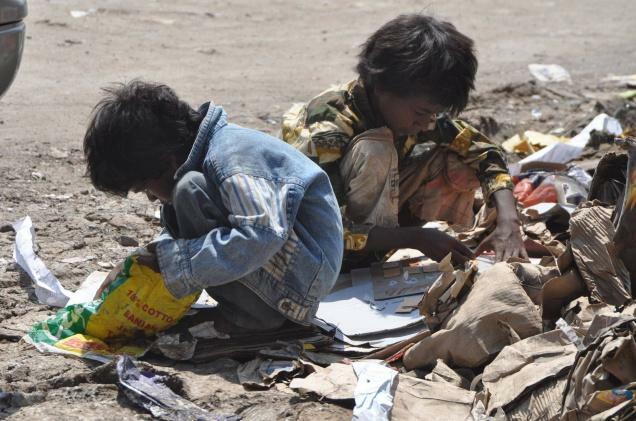 Now that India’s children have a right to receive at least eight years of education, the gnawing question is whether it will remain on paper or become a reality. One hardly needs a reminder that this right is different from the others enshrined in the Constitution, in that the beneficiary —a six-year old child — cannot demand it, nor can she or he fight a legal battle when the right is denied or violated. In all cases, it is the adult society which must act on behalf of the child. In another peculiarity, where a child’s right to education is denied, no compensation offered later can be adequate or relevant. This is so because childhood does not last. If a legal battle fought on behalf of a child is eventually won, it may be of little use to the boy or girl because the opportunity missed at school during childhood cannot serve the same purpose later in life. This may be painfully true for girls because our society permits them only a short childhood, if at all. The Right to Education (RTE) has become law at a point in India’s history when the ghastly practice of female infanticide has resurfaced in the form of foeticide. This is symptomatic of a deeper turmoil in society which is compounding traditional obstacles to girls’ education. Tenacious prejudice against the intellectual potential of girls runs across our cultural diversity, and the system of education has not been able to address it. The new law has many critics. Some of them are among the nation’s best known educators and, therefore, their concerns must be heard. They have raised two major issues: one, the law does not cover pre-school education; and two, it offers no vision of systemic reforms leading to a decent common school system. Both issues are valid and the government’s strategy to implement the law must cover them. As for the first issue — coverage of early childhood — a first step can be recognising the year before Class I as a necessary pre-school year to provide an enabling experience for the success of eight years of formal education stipulated by law. This step would require substantial planning and coordination among the departments of Child Development, Health and Education. The second point the RTE critics are making draws attention to the divisive, and not just divided, character of our system of education. A vast gap of resources, facilities and efficiency exists between the private schools which cater for the better-off strata of society and the ones run by the government. Within government schools, there is a vast difference between Central schools and those run by municipalities and village panchayats. It is not true that RTE offers no vision of improving our fragmented system. The provision for 25 per cent reserved seats for poor children in all private schools as well as Central schools makes a gesture towards the common school model. Critics of the RTE rightly find it a weak gesture but they forget how difficult the execution of even this diluted form of common schooling is going to prove in a stratified and divided society. Already, lobbyists of private schools have gone to court, challenging the legal validity of the RTE. The private sector in school education has grown quite substantially and rapidly over the last two decades. Not just private schools, a strong ideological lobby which favours privatisation has also grown. Members of this lobby believe that the RTE can best be implemented by market forces and the government should subsidise these forces by distributing school vouchers. This remarkable philosophy sees the RTE as a crowning moment in the ongoing history of the state’s withdrawal from education. Critics of the RTE rightly suspect that it could speed up commercial privatisation. Considering how fast popular disillusionment with the state’s capacity to provide education of reasonable quality is spreading, we should not be astonished if the critics are proved right. Many State governments see privatisation as a real option, and the signals coming from the Centre seem to endorse this view. However, the debate over private versus public interests conceals the single greatest problem both private and government schools face: the shortage of qualified teachers. Behind this shortage lies a long history of neglect of teacher training and the poor social status of the elementary school teacher. Teacher training has remained on the margins of the Indian academia, and the training of primary school teachers outside it. The National Council for Teacher Education (NCTE) has reinforced this message of the RTE by demanding a higher entry-level qualification for elementary teachers’ training. The NCTE has also sent a strong policy signal that all courses for this level should come under the purview of universities. These signals will require sustained follow-up action, for which the NCTE will have to improve its own functioning and image as a regulatory body. Going by RTE norms, at least a million teachers will need to be freshly recruited and trained. The challenge of teacher recruitment and training will prove especially grim in the Hindi belt and the northeast, West Bengal, and Jammu and Kashmir. In Bihar, the number of teachers required is very huge and the institutional capacity for training very low, and in Madhya Pradesh, no one knows how to undo the decision taken long ago to stop the recruitment of career-path teachers. In West Bengal, overlapping structures have impeded curricular and administrative reforms. These States are not the only ones battling internal legacies of neglect or confused planning. The northeastern States have a vast number of untrained and poorly qualified teachers who are already in the system. Violent conflict between the government and the people has cast a shadow on childhood in many parts of central and northeastern India. The progress of the RTE in these parts cannot be easy or smooth. This also holds true for mega-cities like Delhi, Kolkata and Mumbai where children of the poor live in Dickensian misery. For the southern States where the system is in better health, the RTE will pose the challenge of radical improvement in quality. How things turn out will depend on the willingness of the directorates to adjust their outworn perspective and policies to the new expectations the RTE arouses in syllabus design, teacher preparation and deployment. Kerala and Tamil Nadu are better placed than any other State to implement the RTE with confidence, but even they require radical measures to improve teacher training. The courses available are uninspiring and based on obsolete ideas. The pedagogic perspective of the National Curriculum Framework (2005) is yet to percolate into teacher education programmes. While the RTE’s future depends on the initiative and resolve of the State governments, the Centre’s role is going to be crucial too. If its policy signals remain coherent, the States will have a better chance of staying on track. One major signal the Centre must send pertains to institutional strength and capacity to deliver the RTE. No case illustrates this better than the National Commission for the Protection of Child Rights (NCPCR), which has the responsibility to monitor the RTE. It is supposed to keep a vigilant eye on several million classrooms where children are to be taught and protected from corporal punishment, mental harassment and discrimination. How is the NCPCR going to perform this huge task with the extremely meagre infrastructure it has today? When a child falls victim to neglect, abuse or violence, the protective arms of the state must reach out fast. For a national commission to serve children in every corner of the country, it must have good State-level units with district-level branches. As of now, the NCPCR’s presence in most States is barely symbolic. Between the responsibility entrusted to it and its apparatus, there is a vast gap. It has no academic staff to study cases and to work with the States to find solutions. Its first chairperson, Professor Shantha Sinha, was a tall academic figure who put in a monumental effort to make its presence felt. Asking her to stay on to initiate institution-building would have been a sensible step, and one hopes that the Ministry of Women and Child Development might still take this decision. If the NCPCR becomes an empty shell, so might the RTE.